Hyatt Hotels Corporation is an American global hospitality company founded in 1957. Its portfolio includes eight different family-friendly hotel brands, including Hyatt, Park Hyatt, Grand Hyatt, Hyatt Regency, Andaz, Hyatt Centric, Hyatt Place, and Hyatt House. As of the start of 2016, the company's worldwide collection consisted of 638 properties in 52 countries. The all-suite chains (including Hyatt Place and Hyatt House) are particularly popular with families because guestroom floorplans feature separate living and sleeping spaces and conveniences such as kitchens and laundry facilities. Hyatt's flagship hotel brand includes mid-size and large, premium hotels and resorts ranging from 200 to more than 2,000 rooms. Many feature elaborate pool complexes with multiple swimming pools, waterslides, lazy rivers, and so on. Some Hyatt Regency properties offer Camp Hyatt kids clubs (for a fee) for kids age 3 to 12, in Full-day or half-day sessions. Camp Hyatt programs typically incorporate local flavors, such as hula dancing and lei-making in Hawaii or surf lessons in Southern California. Hyatt Regency Orlando International Resort, a luxe property right inside the airport terminal, is a terrific place to stay before or after a family cruise out of Port Canaveral, Florida. Hyatt Regency Huntington Beach in Southern California offers a Camp Hyatt with activities that include a pool and beach games, night swims, smores roast, storytelling, stargazing, koi fish feeding; sand crabbing, sand art, and more. Hyatt Regency Tamaya Resort & Spa, a 500-acre resort in New Mexico, has a unique setting on land that's part of a Native American Pueblo. 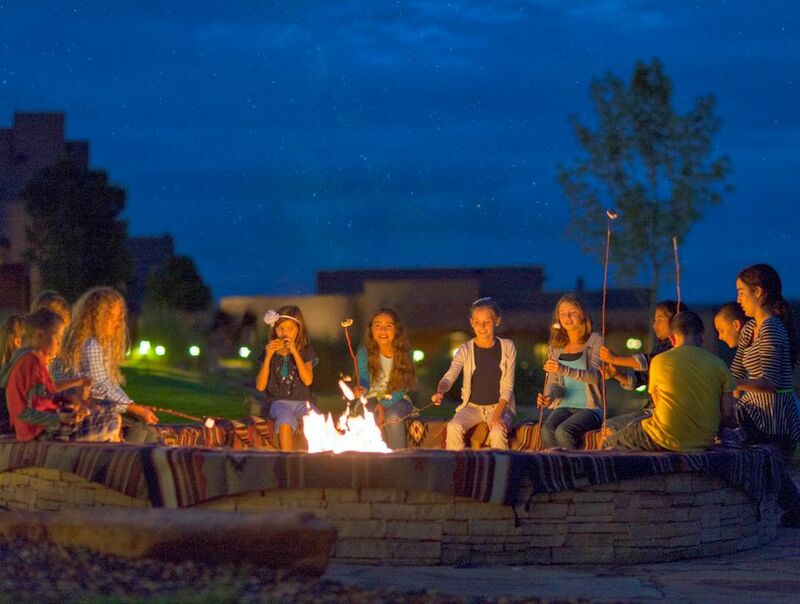 Family programming includes such activities as native pottery-making, adobe brick-making, Native American stories under the stars (with smores), and horseback outings to view petroglyphs and ruins. Another luxury brand in the portfolio, Grand Hyatt properties are found mainly in cities and resort destinations. They feature dramatic architecture, spectacular lobbies and public spaces, and multiple dining and entertainment venues. Properties feature the Grand Club, a private lounge on select guest floors that offers a complimentary continental breakfast, all-day refreshments, evening cocktails, private concierge and other services. For families, it can make a lot of sense to upgrade to a Grand Club room, since you would easily recoup the added expense with the complimentary food. Grand Hyatt Kauai Resort & Spa in Hawaii boasts an impressive cluster of pools including a lazy river, 150-foot waterslide, and a large, saltwater lagoon. There's also a luau right on-property and a Camp Hyatt for kids. Grand Hyatt New York, located a few steps from Grand Central Terminal, offers a nice fitness room and two dining options: a sit-down restaurant/lounge and a market where you can grab a coffee and a range of snack and meal options throughout the day. Families that upgrade to a Grand Club room can also take advantage of complimentary breakfast and evening snacks in a private lounge. This is an upscale brand with many city locations. Hyatt Times Square New York has a killer location in Manhattan's Times Square and Broadway neighborhood, and a variety of room categories ranging from standard rooms to spacious. modern suites for families. Hyatt Place New York Midtown South boasts a great location in midtown Manhattan, offers spacious rooms and a list of good-value amenities that includes an extensive hot-and-cold buffet breakfast, free wi-fi, and an on-site fitness center. A huge hit with families, Hyatt House is a chain of upscale, residential-style hotels that offer contemporary apartment-style suites that include full kitchens, comfortable living rooms, large bedrooms and stylish bathrooms. Features include a complimentary breakfast, a workout room, and laundry facilities. This brand of residential luxury properties is mid-sized hotels located in cities and other premier destinations. This is the latest brand launched under the Hyatt umbrella. It is a full-service lifestyle brand designed for both business and leisure travelers. In 2013 Hyatt introduced their first all-inclusive resort brands, Hyatt Ziva and Hyatt Zilara, with properties in Cancun, Puerto Vallarta, Los Cabos, and Jamaica. Note that Hyatt Zilara properties do not allow children.